After all the hype - and a couple of months of steady use, here's a short review and a few thoughts about Sony's NEX-7 digital camera. Before I start though (and in case you haven't already noticed), it's a remarkable time for photography as a whole. Technological advances in cameras are having an enourmous impact on both professional and amateur photographic communities. We're seeing consumer level cameras with sensor resolution and light sensitivity that is pushing digital photography well beyond what would have been possible with film not so many years ago. Or perhaps put another way - as little as three years ago, only professional-level digital cameras could produce images in low light with good image quality - good dynamic range, good blacks and little noise or other artifacts. If anyone reading this post remembers the challenges of 'pushing' color slide film to 1600 ISO, you'll share my sense of wonder at what we are now able to achieve with modern digital cameras. And of course for those of you who have no idea what that means - well, it doesn't matter much. What's great is that nearly everyone can now take pictures of their fun, frivoulous and cherished moments - without having to worry too much about the previously challenging tasks of considering the amount of available light, and correctly exposing an image. That said, there are still differences between cameras that matter. However, how they matter depends on how you feel about photography. For those who aren't overly concerned with photography as a craft - well, sit back and enjoy the ride because your cameras are only going to get better and do more remarkable things every year as newer and more impressive consumer-level models are released with better screens, better lenses, better sensors, rugged, networked and even waterproof features. For those who still cling to photography as an art, and who want to provoke, engage and change the way others see the world we live in - well, things are getting pretty good here too. Which brings me to the title of this post and my own experiences as a former owner of a professional level DSLR, and someone who is hoping for a certain kind of camera these days. Without phase detect autofocus, capturing a shoot-from-the-hip image like this would be challenging to say the least. Although I don't make a living from photography, I was fortunate enough to have been around and inspired by some very talented photographers - some of whom were kind enough to give me a little advice. I'm also a bit of a geek, and was until recently a bit of a gear-head where camera equipment was concered. I had a Nikon D700 and three of Nikon's best lenses - the Nikkor 14-24mm, 24-70mm, and 70-200mm. I loved the range and the speed of the Nikon D700. Speed in every sense - handling, shooting, settings. It took me a few months to get settled in, but once I had the handling down, I could pick up and shoot in nearly any environment almost without thinking about the camera itself. I just knew what I wanted to do - and did it. I remember days of heading out to explore or just sit and watch and record the things that were happening around me. And I remember often feeling that those were some of the happiest moments of my life. It might seem a little odd then to return from such happy and reflective moments, to the seemingly mundane review of a camera's features and technical specification - but there's a point to this. The camera I was using at the time was a remarkable peice of engineering. It was crafted in a way that effectively made it disappear. I could take a picture, and the camera wasn't there. All that mattered was my point of view. Well almost. What eventually caught up with me and my happy moments was lugging around between 7 and 10 kilograms of camera gear and accessories, as well as a growing appreciation for a more candid and less obtrusive form of photography. And so it was after reading some of the early reviews of the Sony NEX-7 that I decided to unload my DSLR and lenses and wait for the next breakthrough in digital photography to arrive. I knew I was going to be making a compromise of sorts, but what I hadn't anticipated was how much I was going to miss my D700. The hype, the press, the anticipation surrounding the NEX-7 reached its peek when it was announced that Sony's factory in Ayutthaya province had been closed because of flooding in Thailand. Sony was forced to move its NEX-7 and Alpha manufactoring facilities to another factory in Chonburi - and this meant about a four month delay before cameras started hitting the shelves. From everything I'd read before actually holding the camera in my own hands, I believed the only major sacrifice I was going to make was in the downgrade from fast phase detect autofocus, to the slightly clunkier yet nippy contrast detect autofocus of the NEX-7. But I figured the weight tradeoff and reduced size would be worth it. I was nearly right - but not quite. For me at least, there are two major disapointments in the NEX-7. The first is overall handling. Sony and the army of early reviewers made a big deal out of the fancy tri-nav control system. And it's true that the tri-nav control combination is good, and certainly an improvement over the NEX-5N, but the controls on the Sony NEX-7 are not professional level controls. The dial adjustment feels fiddly and cheap, as do the other buttons on the back of the camera. The two top level controls while good, aren't as positive or as stiff as I would like them to be. The overall effect is that I cannot use the camera as switfly or as positively as I would like to. Apples and Oranges you may say when compared to a D700 - but I know that it is possible to build a camera that has the best of both worlds - and that includes the postitive handling of a professional DSLR. 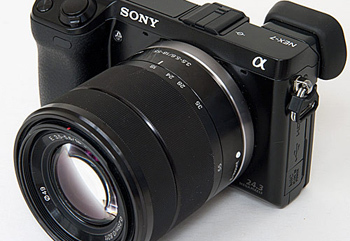 My second diaspointment with the NEX-7 is Sony's lens line-up. What Sony should have done was release three good quality fast autofocus primes (as Fuji have done with the X-Pro 1 - although I'm not buying into the Fuji story either), at 16mm (effective 24mm), 35mm (effective 52mm) and 75mm (effective 105mm). A lens line-up like this would have signaled a real commitment to the NEX range, and boosted the confidence of would-be NEX buyers. And of course at least one fast and decent mid-range zoom would have been the icing on the cake. My NEX-7 with an LA-EA2 adapter attached, and the Sony version of the famous Carl Zeiss 85mm f1.4 Planar T lens. Phase detect focusing was very fast and believe it or not - handling (except for the controls) was fine. What I will give Sony credit for is this. They created a camera that has shown everyone what's possible. The electronic viewfinder is amazing. The sensor - excellent, and I don't feel any sense of compromise here between the NEX-7 and my D700 (there is a small difference, but not one that matters to me). Contrast detect autofocus is pretty good and Sony have also done something that borders on genius in releasing the LA-EA2 adapter which contains a translusent mirror and Sony's phase detect autofocus assembly. For any of you out there that will complain that the adapter and an Alpha lens makes the Sony bulky and awkward - all I can say is actually try it first. I have - and it's amazing what happens when you put this adapter on the body, and attach one of the better Alpha lenses to it. It works - really well. What that means is that Sony (who I wouldn't normally have considerd as a serious option for my photographic needs) have created a system that breaks down into a very small package, with the NEX-7 and a small prime or pancake lens, and yet can expand to include a professional lens with phase detect autofocus when required. It's a very impressive solution. So what does all of this mean? The Sony NEX-7 was close, very close to what I would love in a camera, but the fiddly handling, amateur controls, and mediocre build quality have left me disappointed and unable to use the camera in a way that removes the camera from the equation. It's a camera that's shown us the future, but has failed to realize that vision itself. Your perspective sets you apart from the hype machine. Great to read something that wakes the mind up to think outside of the "box" you last opened hoping the camera inside it was the answer to getting you outside of the "box" one is in. Photography is about expression. The technology of the pin hole camera was replaced with "better" technology, and so it goes on and on. In with the new and out with the old. Nice to see you noticed that the new is not the answer always. Be it new camera, new car, new wife, etc...... I'm still using film, 4/5, 120, 220, 35mm, enlargers, etc. I'm not looking to digital to replace film, but to be used with film if it gives me more leverage of expression. Photography: pictures, light, color, black and white, film, digital, all coming together to express what's outside. Thanks from someone who still is a photographer after 46 years. It's a joy to be free of the latest product intro.